It’s September the 13th (and coincidentally a Friday) which means it’s Blame Someone Else Day! So I’m blaming Tamora Pierce of all this fantasy nonsense I’ve been putting out. Here’s my picture of Alanna of Trebond and you should check out other peoples influences/scapegoats at United Webcomics. 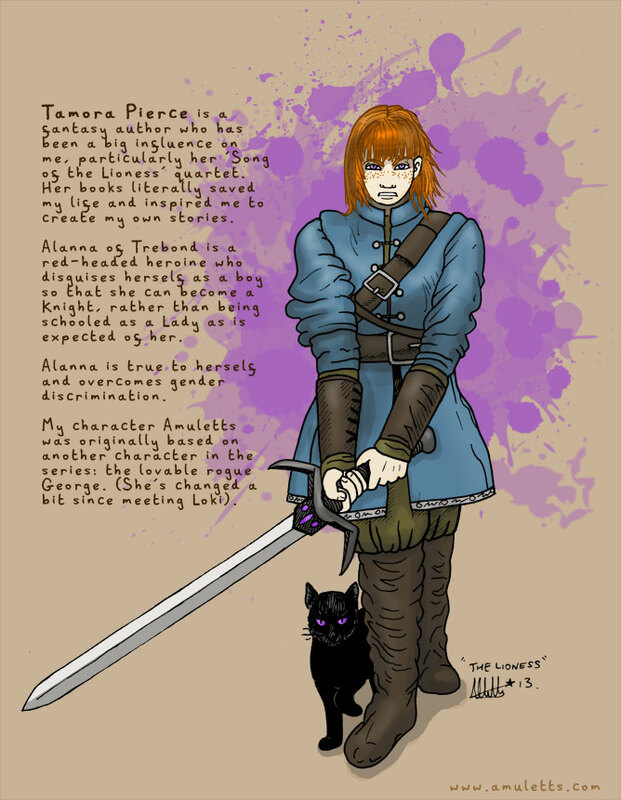 Tamora Pierce is a fantasy author who has been a big influence on me, particularly her ‘Song of the Lioness’ quartet. Her books literally saved my life and inspired me to create my own stories. Alanna of Trebond is a red-headed heroine who disguises herself as a boy so that she can become a Knight, rather than being schooled as a Lady as is expected of her. Alanna is true to herself and overcomes gender discrimination. My character Amuletts was originally based on another character in the series: the lovable rogue George. (She’s changed a bit since meeting Loki).